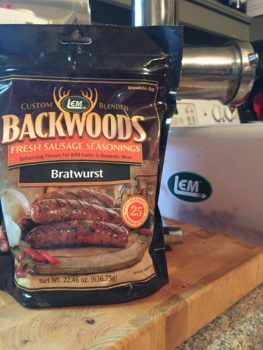 Making bratwursts or summer sausage is an easy way to use the meat from a whole deer, especially a large or older buck or doe that will likely be tough. 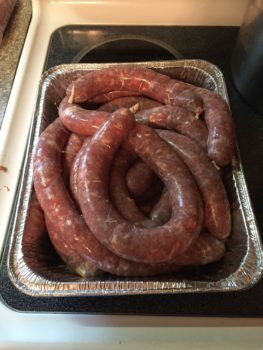 Below are step-by-step instructions to making your own homemade venison brats. Debone shoulders and hams from a whole deer, removing fat and sinew. Use neck and rib meat if needed, to get a total of 20-25 lbs. 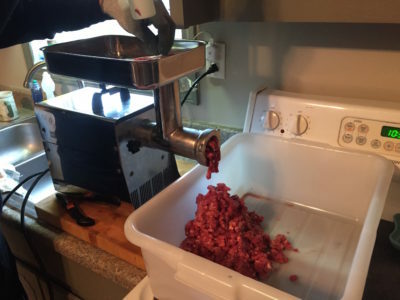 Using an electric grinder, grind all venison into a meat tub or large pot. 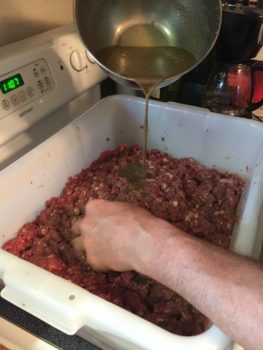 Grind pork or beef fat separately, and then mix into venison until distributed evenly throughout. I recommend the Lem #8 meat grinder from Bass Pro Shops. We purchased ours nine years ago, and have ground more than 1,500 lbs. of meat—including 40+ deer, buffalo, hogs and elk. Still works perfectly with no issues. There are several ways to obtain pork or beef fat. Ask your local meat store or grocery store if they sell it, or contact a local farmer. 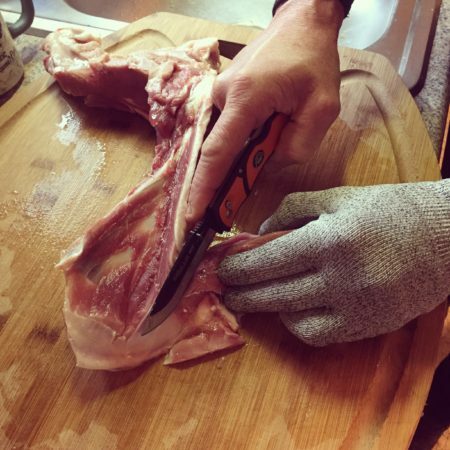 We raised a domestic hog and saved the fat once we butchered it. You can also substitute bacon for the fat. Before grinding the fat, let it freeze slightly so it makes pellets when ground. If it’s too soft and warm, it will be greasy and melt when grinding. Prep seasoning by mixing with cold water, as instructed on package. Add seasoning and water mixture to meat, one cup at a time, mixing thoroughly after each cup. Keep meat mixture in meat tub and refrigerate overnight. Prep casings by rinsing with warm water to remove cure and salt. Refrigerate in water overnight. 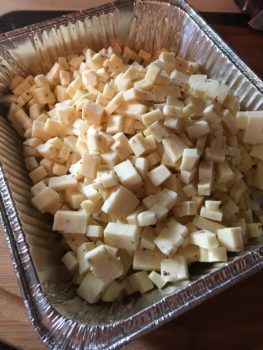 Cut cheese into ¼” cubes and mix thoroughly into meat. Use any kind of cheese preferred. Pepperjack adds a little more spice and melts better when cooked. 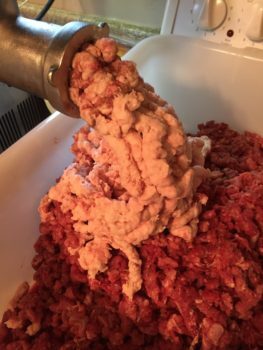 Cheddar stays in larger chunks when the brats are cooked. During this step, you can also add chopped peppers, such as jalapenos or habaneros, if you like spicier foods. 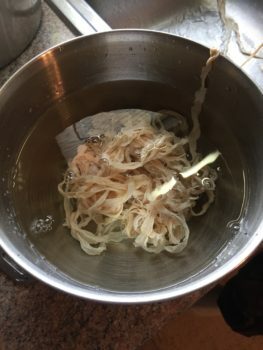 Rinse casings with cool water. Attach 10mm stuffer tube (ok to use larger size) to sausage stuffer, and fill stuffer with meat. Fit casing over stuffer tube, and knot one end. 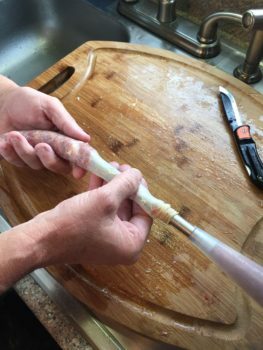 Fill casings with meat until expanded, being careful not to rupture the casing. Once the brat is to the desired length, cut casing and knot the end. Repeat until all meat is used. 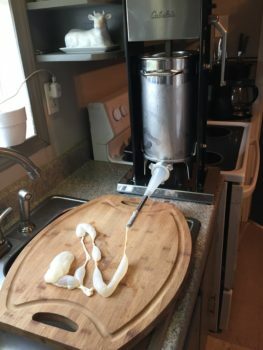 Using a standalone sausage stuffer makes the cheese stay in larger chunks. We used the Cabela’s Commercial Grade Stuffer, 11 lb. model. You can use the electric grinder without the blade in place to also stuff the casings, but it regrinds the meat, causing the cheese to break up. The small stuffer tube size is easier to fit the casings over without tearing them, but you can use larger size tubes. Brat length depends on preference. 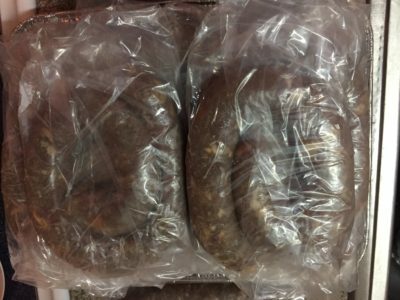 You can tie them at standard brat length, approximately 6”, but you will use more casings. We make ours approximately 18” and cook whole, then cut into thirds after cooking. 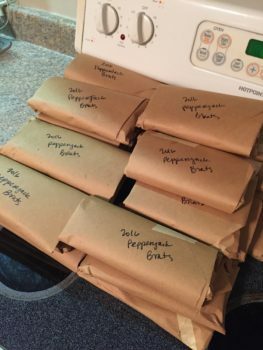 Place brats individually in freezer bag and wrap with freezer paper. Label and freeze. Recommended meat storage is up to 1 year in the freezer to maintain flavor. And the best part: Cooking and Eating! Spray grill grates with non-stick cooking spray. Grill brats over direct heat on charcoal or gas grill for approximately 5 minutes per side, flipping only once using tongs to prevent puncturing. Enjoy alone, or on a bun with your favorite toppings. 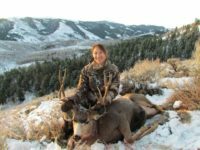 Sarah is an avid hunter and outdoors enthusiast who lives on a farm in Kentucky where she raises cows, chickens,a nd keeps bees.. She enjoys gardening, canning, crafting and traveling and is also a member of the Huntress View team, an organization formed to help strengthen the ever growing community of women hunters.